We race for the stairs to the basement. We kids grab the pails and head out. With thoughts of pies in our heads, we take the path along the slough. There, the huckleberry bushes grow in abundance. This is the spot we found last year when Mom showed us how to pick huckleberries. She grabbed a limb loaded with berries and stripped it off into her hands. The sound of the ping, pinging of the berries filling our pails soon dims as the pails fill. The younger ones stuff their mouths with handfuls of sweet ripe berries, but we older ones know huckleberry pies are on the horizon. On this hot summer day we head for the slough. We place our brimming pails on the path, take off our shoes, roll up our pants and wade out into the mud flats. The tide is out. The cool mud seeps between our toes. Our feet make a sucking sound as we pull them out. “Hey, stop that,” as a blob of mud hits me. I grab a handful and throw it at my brother. He tries to get out of the way, but he can’t jump because his feet are stuck in the mud. We are sitting ducks. Everyone is a target. Back home we hose off each other. Showing Mom our full pails, “Dump them into the water in the sink.” The green berries and leaves float to the top and Mom skims off these. Huckleberry pies for dinner tonight! 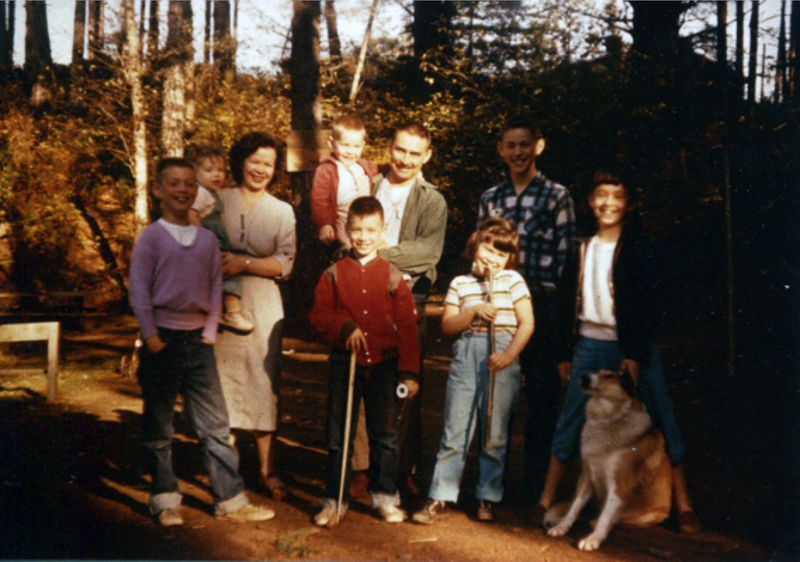 Left to right: Henry, Mom with Baby Frank, Carl (in front), Dad with Conrad, Jan (in front), Tommy (in back), and me with our dog. Just before school starts in late August, Mom calls out to us. “Go get your berry pails; we are going to pick blackberries, so I can make jelly.” Mom’s blackberry jelly is legendary. Mom pulls a long plank out of the garage and tells the older boys to bring it. The youngest is in a baby buggy. The rest of us go behind her single file along the county road to her secret place. She holds the plank up on its end next to the black berry patch and lets the plank fall into the middle of the patch. She steps up on the plank jumping up and down as she walks along to the end. “Okay, come on carefully and line up on the plank.” We take turns standing guard over the baby and walking out on the plank. We feel like pirates. It’s scary out on the plank, but thoughts of Mom’s jelly turn our minds to filling our pails. “Everybody off.” Slowly we back off the plank. Mom pulls the plank out. We move further along the patch. She repeats the process. With our pails full we head home. That night she surprises us with blackberry cobbler for dessert. “But, Mom, will there still be enough berries for your jelly?” She smiles. Several days later we kids are walking along the county road to visit Dad. He is working at the boat shop a mile from our house. There are large puddles alongside of the road with pollywogs just beginning to form their hind legs. We need to catch them, but they slip through our fingers. “Hey, somebody run home and bring our berry picking pails,” shouts my older brother. I run back to the house. We figure out how to hold the pail just so, so the water slides into the pail bringing the pollywogs with it. Our pails filled with, soon to be frogs, we run home with water sloshing against our legs. The pails are lined in a row on Dad’s workbench. We check them daily, but two days later we discover that our ducks have made a nest and laid eggs. Pollywogs forgotten, we watch the nest each day. “What’s this mess?” We hear Dad holler out. We run to the basement. On his bench the five rusty berry pails are reeking with dead pollywogs. Wide-eyed we look at each other and race back upstairs.